In any case, in the temple's depiction of Paramapadam, I saw the usual attendants of Vishnu, like Garuda and Vishvaksena (whom I discuss here), but I also saw two human figures, Uparichara Vasu and Uttanka. 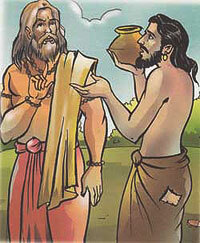 Uparichara Vasu was an ancient king who was the father of Shantanu's wife Satyavati. As I discuss in this answer, he was cursed by some sages to fall deep within the Earth, but then he ultimately attained Vishnu's abode of Paramapadam, as described in this chapter of the Shanti Parva of the Mahabharata. "On those days, O regenerate one, in which thou wilt feel a desire for water, clouds well-charged with water will rise over this desert. Those clouds, O son of Bhrigu's race, will give thee savoury water to drink. Verily, those clouds will become known in the world as Utanka-clouds." Thus addressed by Krishna, Utanka became filled with gladness, and to this day, O Bharata, Utanka-clouds (appear and) shower rain on and deserts. But my question is, if Uttanka didn't drink Amrita and Krishna only gave him a boon for rainclouds, why is Uttanka depicted in Paramapadam? When and how did he achieve Moksha? Are there any scriptures which describe Uttanka attaining Moksha? Browse other questions tagged mythology vishnu krishna sri-vaishnava lokas .